Every day I journey through a network of blogs, Tweets and Facebook posts, looking for the nuggets of inspiration I find being shared by people I've met on-line over the past decade or longer. This graphic was on a post by Kevin Hodgson, a middle school teacher from Western Massachusetts. I've pointed to Kevin's blog often in the past, and the #clmooc network where we first met in 2013. 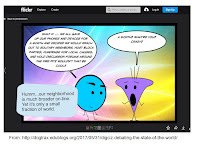 Kevin's article introduces a month-long conversation about Digital Citizenship, using the hashtag of #digciz, and using cartoons like the one above. I followed the link on Kevin's page, to this link, where I read about the event. Then read a blog article by Mia Zamora, introducing the event, and another by Bonnie Stewart, reflecting on the event. 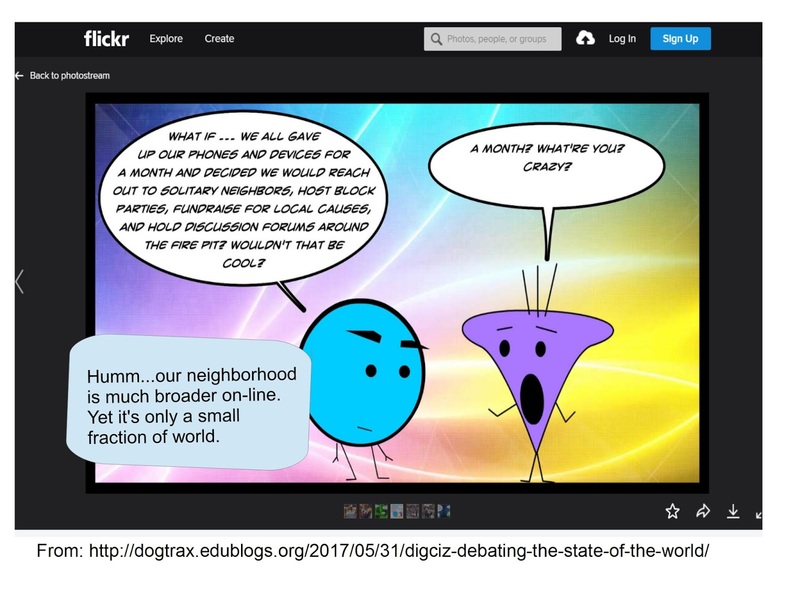 Mia's blog article showed a schedule for June 2017 and encouraged a #4wordstory on digital citizenship. 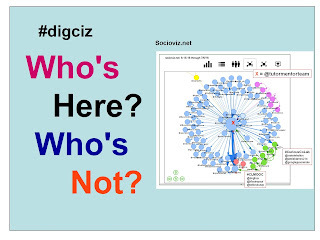 Bonnie's blog article expanded on this, with her own thoughts and ended by saying "Tell us your #4wordstories of what YOU want, using hashtag #digciz". That's mine at the right. In Kevin's graphic he said "What if...we all gave up our phones and devices for a month and reach out to solitary neighbors, host block parties, and hold discussion forums around the fire pit? Wouldn't that be cool?" I guess that would be, but how do you define "who your neighbors are" or "what the boundaries of your neighborhood are?" I lived on the North side of Chicago in the Rogers Park neighborhood from 1973 to 1988 then moved to Park Ridge, an affluent suburb just outside the city boundary, near O'Hare Airport, where I've lived since then. I got involved with helping inner city kids living in the Cabrini Green area (Near North) in 1973 and have stayed involved with urban youth and their well-being for the past 43 years. Thus my neighborhood, or community, is not defined by geography or where I live, but by what I care about and who I'm trying to help. Chicago has more than 3 million people and the region has more than 11 million. There's no logistical way to have a block party or a face-to-face meeting with more than a few of those people. Thus, I've been trying to bring this community together on-line since I learned about the Internet in 1998. Thus "Who's Here? Who's Not?" is a primary focus, because if it's just you and a few friends talking about poverty and segregation in Chicago, or trying to help non-school tutor/mentor programs grow in all high poverty neighborhoods, you can't really have much impact. 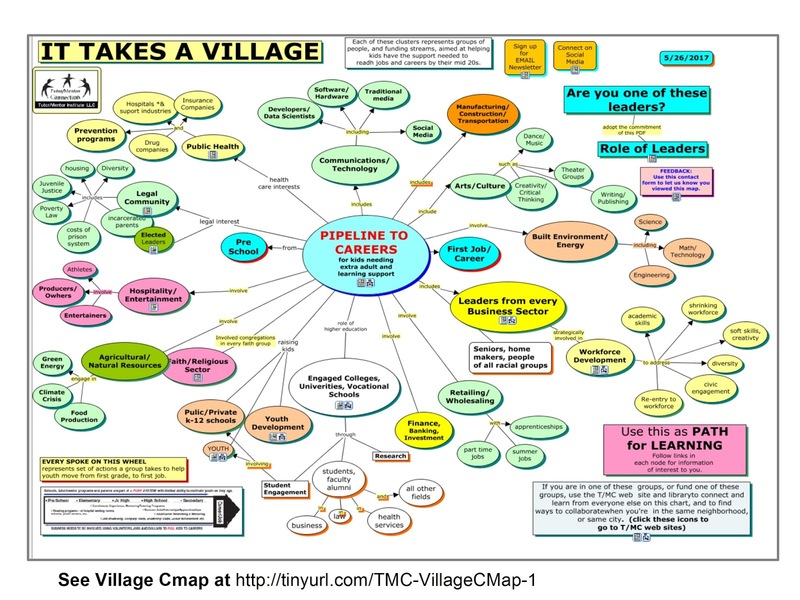 This VILLAGE MAP emphasizes the need to engage people from many different sectors in on-going conversations, like those I've been having with a few of the people I've met on-line in the past 10 years, and like the #DigCiz activity seeks to bring together. In my "Who's Here?Who's Not?" 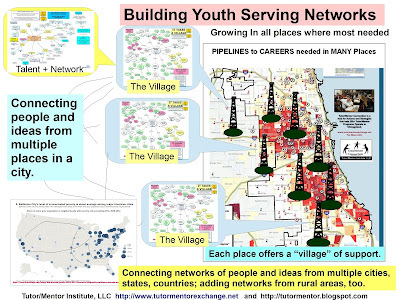 graphic I include a network analysis map created using the SocioViz tool. I saw a similar map in this article on the #DigCiz site. 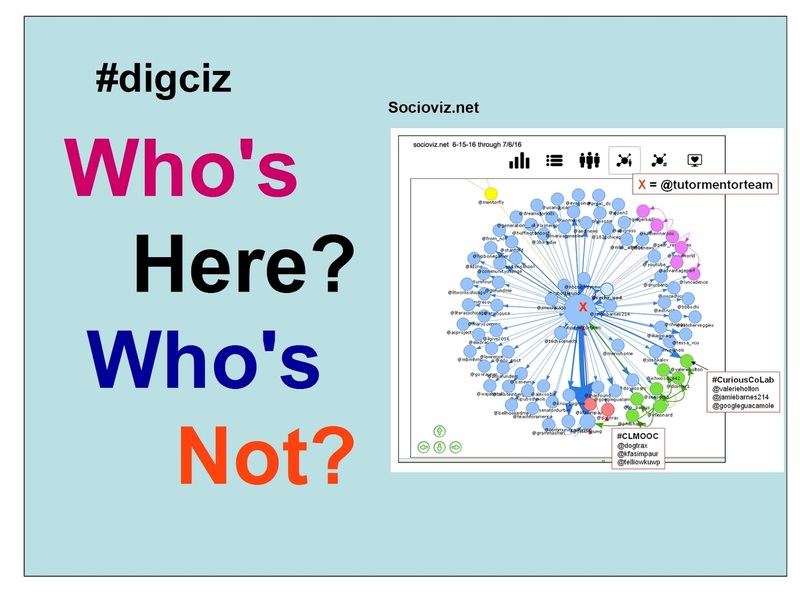 Using this and similar tools we might begin to answer that question and make efforts to reach out and try to engage those who are not yet "here" in the on-line conversation, or who we can only reach off-line. When saying "Who's here? and Who's not?" we need to understand that less than 30% of the US population use Twitter and while more use Facebook (see report), the reality is that your posts only reach a small fraction of your followers, and an even smaller fraction of those around the world who might be interested in what you have to say. That should be part of the discussion of Digital Citizenship I think. This graphic illustrates the goal of my work, and a portion of the Digital Citizenship I hope to inspire. 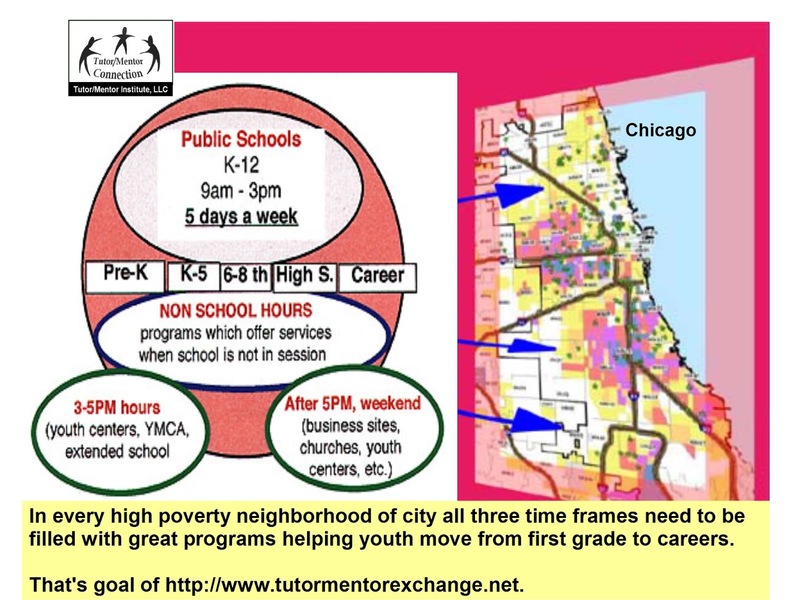 Let's fill all high poverty neighborhoods of Chicago and other cities and states with mentor-rich programs that help kids through school and into adult lives, reaching youth during the school day, right after school, or right after work when workplace volunteers may be more available for weekly tutor, mentor sessions. Until more people are engaged in that discussion and working to make it a reality, much of the good things we'd like to see happen in the world are only going to be available to a few. 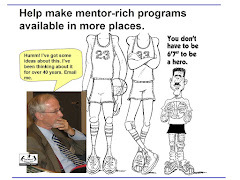 While I hosted Tutor/Mentor Leadership and Networking Conferences in Chicago every six months from May 1994-May 2015, I was never able to get more than a few of the non-school programs in my database to attend regularly or engage in capacity building discussions. And I was less successful in getting others who need to be in the discussion to participate. I've been even less successful in connecting to Chicago programs and leader on-line even though I follow many on this Twitter list and on this Facebook list. So, instead of saying "join my discussion", I'm saying join in discussions hosted by others, with topics you might be interested in, such as Digital Citizenship. I'll meet you there. So, if you're reading, join in. Then, let's talk about "Who's here and Who's not." Thanks Vanessa. I hope many educators and their students will dig into the articles and web library I've built since 1998 and apply the ideas in their own communities. There are as many hurdles (who are our neighbors?) as opportunities (paths to reach out). I appreciate you sharing my comic and then extending the conversation. Teaching young people to identify problems/opportunities that interest them, then where to look for information that expands their understanding, as well as people who need to be involved in and solutions, is a process that needs to start when kids are young and continue through a lifetime.